Text and Photos By J. Charles Delbeek During the summer of 2007 I was fortunate to be invited to join a workshop of coral experts organized by the International Union for Conservation of Nature (IUCN). The purpose of this workshop was to examine the status of stony corals in the Indo-Pacific region and to rank them on the basis of their vulnerability to extinction. The workshop was held at the Eagle Point Resort, located in the Batangas region of the Philippines, located a short 3 hour car trip south of Manila. The region we were in is locally known as Anilao, located on a small peninsula it is designated as a marine park and requires a daily dive fee that goes towards protecting the area. While most of the week was spent in meetings we did manage to do a couple of dives one day, and I was able to get some snorkeling in the day I flew back to Hawaii. It just two years I had changed jobs and as senior aquatic biologist at the newly reopened California Academy of Science’s Steinhart Aquarium, I was part of a collecting and research team that headed back to Anilao in May of this year. Again we spent several days in meetings, but this time we were also able to get five days of diving in, and we were also able to get the necessary permits to allow us to collect live corals for export back to San Francisco. But that is another story for another article. What I would like to do in this article is to describe my experiences diving this region for just the second time. The Philippines has gotten a bad reputation in the aquarium hobby mainly due to the widespread use of sodium cyanide to collect fish for aquariums as well as for the live food trade, and for dynamite fishing for food fish. However, there have been many conservation success stories in the Philippines, and many of these are happening at the grass roots level with local fisher folk taking a more active role in protecting their own reefs. The Philippines lies at the center of the coral triangle region of the Pacific and as such has arguably the highest diversity of marinelife found anywhere in the world. This makes diving here some of the most rewarding diving, particularly in areas that have been protected from some time from commercial fishing and collecting, such as the Anilao region and Tubbataha Reef (http://www.tubbatahareef.org/). 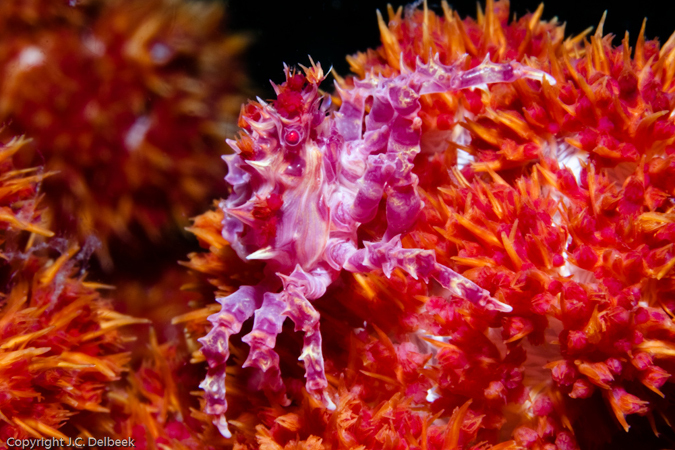 Perhaps due to the stigma of sodium cyanide, most aquarists don’t think of the Philippines as an area to go diving, but you are doing yourself a disservice by not considering this area of remarkable diversity for your next dive vacation. To top it off, the Philippines is still one of the most affordable dive destinations in the world. While my first lodging was at the Eagle Point Resort, complete with restaurant, meeting rooms, air conditioned rooms and a large pool, this time around our team stayed at Club Ocellaris (http://clubocellaris.com/site/), a rather rustic collection of small rooms and one dorm-style multi-room building. With no air conditioning and just electric fans to cool the rooms, it was your basic dive resort (Note: There are now a few air conditioned rooms available). Make no mistake, the resort is comfortable and the food is good, but the main attraction here is the excellent diving–this is a dive operation first and foremost. There is wireless available for free, there are stations to store and prep your underwater photo gear and lots of places to charge your equipment. However, I have no doubt that one of the most compelling reason that well-known diver/photographers such as Roger Steene, Gerald Allen and others come here time and time again is the excellent dive guides that call Club O home. Perry and Alexus’ keen eyes never fail to turn up the unusual and new discoveries, particularly nudibranchs, that can occur on any given dive! 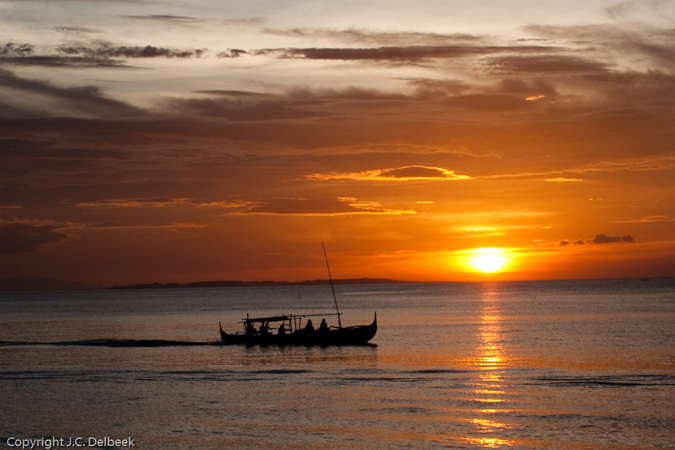 Sunset as a group of divers heads out from Club Ocellaris for a night dive. 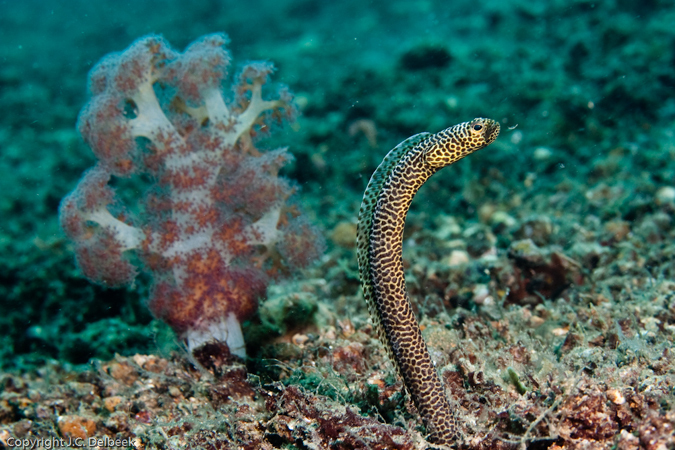 There are a wide variety of dive sites within a short trip from the resort, with the longest trip about one hour. The dive boats are narrow hulled wooden boats with twin outriggers, known as bankas, typically powered by a car engine that drives a long shaft with a single prop, they are remarkably stable and swift. The dining area does not lie far from the dive boats at the tiny, but cozy Club Ocellaris. Twin Rocks Just a few short minutes from Club O is a dive spot known as Twin Rocks, one of the best known dive sites in the region. What makes this site unique in the region is that it is a totally protected area, meaning no collecting of animals or fishing is allowed. The reef is watched over closely by residents that live along the shoreline and any suspect activity is quickly challenged. There are many such conservation success stories occurring in the Philippines and it really is a shame that these activities do not receive the same sort of attention as problems such as sodium cyanide and dynamiting have. Crinoids are extremely abundant in Anilao due to the large amount of particulate matter in the water, here a scene common at Twin Rocks. Consisting of two spires of rock relatively close to shore, the reef at Twin Rocks drops gently down to about 90 feet where it then turns into a gentle sandy slope heading downwards to still deeper water. In this deep water region one finds stands of tall dark purple Dendronephthya standing almost motionless in the gloom. Dotted over the bottom are venomous urchins, Astropyga sp. and groupings of Fungia andHeliofungia. As you approach the reef a profusion of corals appears– Anthellia,Xenia, Scleronephthya, sea fans of all types, Plerogyra, Physogyra, Pectinia,Cespitularia, Goniopora, Alveopora, Cynarina, Lobophyllia, Euphyllia to name just a few. Most striking are the crinoids. They are everywhere, in every color combination imaginable and they seem to be a very characteristic component of many of the Anilao reefs, most likely due to the high level of particulates in the water. As one moves shallower, Acropora and other branching stony corals become more common, forming large branching thickets and tables. Other stonies commonly seen include Echinopora, all sorts of mussids and favids as well as Seriatopora,Stylophora, Hydnophora as well as fire coral (Millepora sp.) 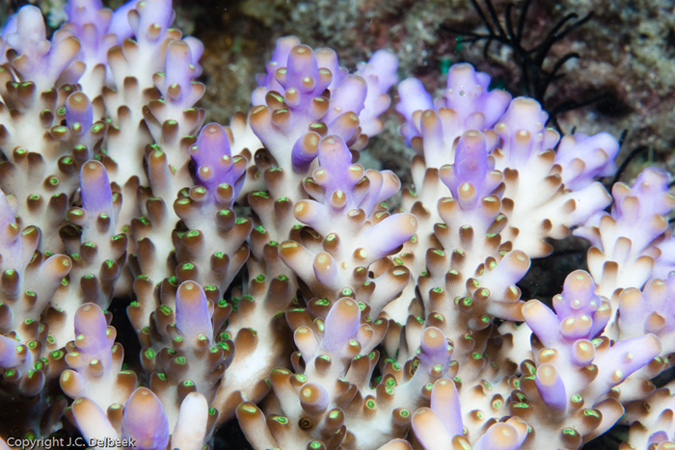 and blue coral (Heliopora sp.). Fish life includes pygmy angels, clownfish, Pseudanthias spp., wrasses of all types, male and female Genicanthus lamarcki are especially common, lionfish, rabbitfish and all sorts of damselfish (Amblyglyphidodon spp. and Chromisspp.). Mainit One dive site that we ended up diving three times, including a night dive, is known as Mainit. It is about a twenty minute boat ride from Club O and when you first approach it, it doesn’t look very promising. You anchor about 20 feet off of a cobble stone beach in front of a closed down resort in murky water and surf. Once you enter the water you swim down about 8 feet or so following the slope downwards into somewhat clearer water. At first glance all you see is a featureless bottom of sand and fine gravel. Every now and then you see a sponge or small non-photosynthetic coral popping up out of the bottom. However, as your eyes slowly become accustomed to the gloom you start to discern movement on and just above the bottom. This is muck diving at its best! You soon start discovering all sorts of really cool critters such as Ambon scorpionfish, juvenile frogfish no larger than a nickel, garden eels, crabs, mantis shrimp, nudibranchs of all sorts, venomous urchins such as Astropyga and Toxoides, which are common in shallow water, and some of the most prized muck diving critters such as wunderpus (Wunderpus photogenicus) and ghost pipefish (Solenostomus cyanopterus) that mimic brown twigs or blades of Halimeda! A Wunderus, Wunderpus photogenicus, spotted at Mainit, barely 4 inches across it is slowly creeping out of its hidey hole to inspect the photographer. 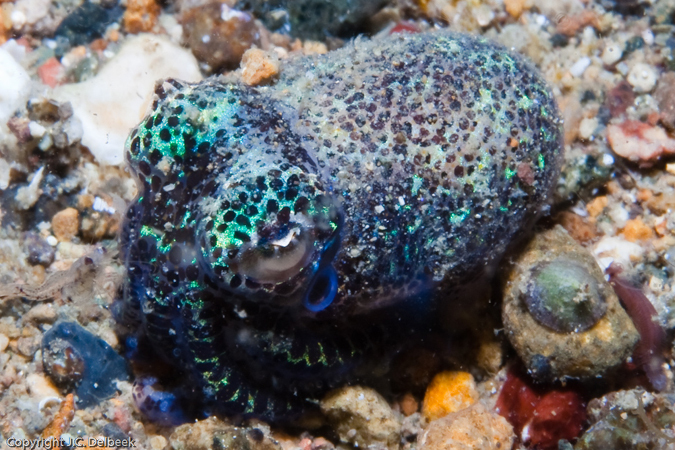 A bobtail squid, Euprymna sp., encountered on a night dive at Mainit. Taylor’s garden eel, Heteroconger taylori, extends out of its burrow at Mainit. Found in small groups, this is a large species, at least 3/4 inch thick. Koala Pt. – 2007, 2009 My very first dive in Anilao was back in July of 2007 and was at Koala Point, just down from Eagle Point Resort where I was staying. We did another dive there this past May. During my first dive, I counted five different species of clownfish!Amphiprion ocellaris, A. sandaracinos, A. perideraion, A. clarkii and A. frenatus! There was also an abundance of Goniopora, Acropora, Fungia and several other LPS corals too numerous to mention. There were also several species of lionfish and damselfish. 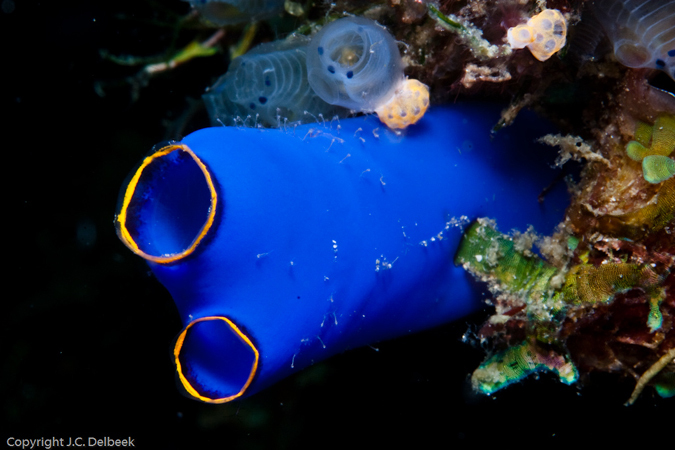 Nudibranchs, xmas tree fanworms, koko tube fanworms, Xenia and Cespitularia were also common. Dead Palm After diving Mainit that first morning we headed back along the shoreline in the direction of Club O to a spot known as Dead Palm, referring to a dead palm tree lying along the shoreline, but which has since disappeared probably during a storm. The shallows of this area had some of the largest stands of Acropora and other SPS corals that I have encountered in Anilao. Extensive fields of Acropora, fire coral, andEchinopora filled the region between the shoreline and about 20 feet. 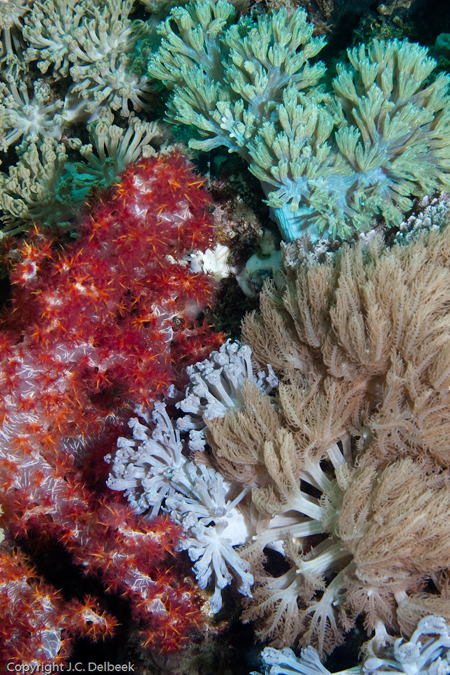 The area was so rich in SPS corals that we decided to do the majority of the collecting in this area. The reef slopes gently down to about 120 feet where it reaches a sandy plain. Here you find large sponges and an abundance of crinoids. 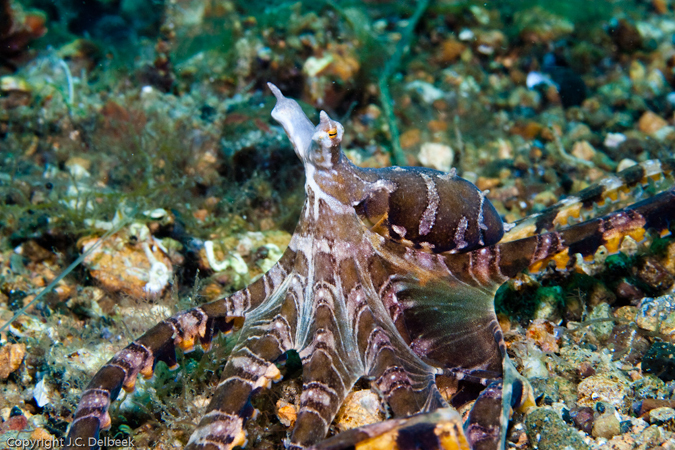 This is where we also encountered our first flashback cuttlefish, Sepia latimanus! Orange skunk clownfish, Amphiprion sandaracinos, at Dead Palm. Anilao Pier Our first day wrapped up with a night dive at Anilao Pier. Just a short 10 minute boat ride from Club O we anchored just offshore in about 10 feet of water and slipped into the inky black waters to the sounds of shockingly bad karaoke singing on the shoreline. Descending to the bottom we were surrounded by bioluminescent plankton that swirled about us emitting an eerie green light show of tiny stars twinkling in the night as we moved through the water,. Once we settled down to the bottom we began to slowly explore towards the shoreline. One of the biggest attractions of night diving is the wide variety of creatures that you see that are normally not seen during the day. The bottom was covered with tiny heart urchins (Marieta sp.?) maybe ½ inch long. We saw several species of scorpionfish, a conger eel, some cool looking flatfish, Cerianthus anemones, several snails, a couple of small octopus, a snake eel, but the star of the show was a small blue-ring octopus that was found “walking” on its arms, while holding two of it’s arms above it’s body… pretty cool! Bethleham The next morning we motored across the channel to a small group of islands. In a cut between two of those islands was our next dive spot, Bethleham. This area had very little water motion and sloped downwards from a sandy beach through a reef zone and then into a rubble area at about 70 feet that turned out to be really interesting due to the macro life to be found there– everything from tunicates and tiny nudibranchs, to pistol shrimp and partner goby pairs were all over the bottom. This is also where you can find several assemblages of flasher wrasses and Cirrhilabrus wrasses as well as angelfish such as Chaetodontoplus melanosoma andC. caeruleopunctatus. As one moves up the slope into shallower water you encounter lots of LPS corals such as Euphyllia and Goniopora, and also large sponges. 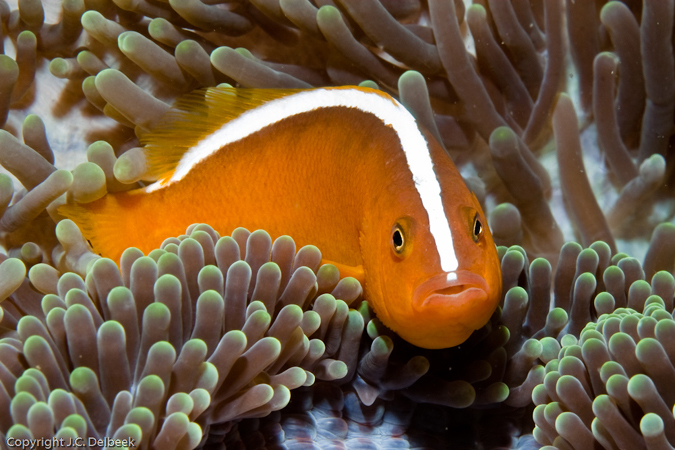 There are lots of clownfish and anemones, jawfish, cardinalfish and damsels. Bethelham is one of the more interesting dive sites in Anilao and well worth several dives, especially deeper ones! Tunicates were especially abundant at Bethlehem. Devil’s Rock About a 20 minute boat ride to the back side of the island group from Bethleham lies a small rock outcropping called Devil’s Rock. It lies on the edge of the Verder Passage and gets strong currents. The first thing that hits you when you dive this location is the profusion of soft corals, Lobophytum, Sarcophyton, Sinularia, , Xenia, Cespitularia, Anthelia, Heteroxenia, as well as gorgonians such as Junceella and black corals deeper down the slope. Dr. Gary Williams of the California Academy of Sciences remarked after first diving this location that he saw more species of soft corals in 10 minutes than he had in 10 years of diving anywhere else in the world! There is also an abundance of nudibranchs, tunicates, anemones, clownfish, pipefish, scorpionfish, sea cucumbers, damsels, and sponges–we literally spent half the dive with our faces a few inches from the rocks just exploring the multitude of macro life on the walls of the this pinnacle. The sheer profusion of soft coral genera at Devil’s Rock, is hinted at in this photo. Kirby’s The next day our first dive spot was called Kirby’s. Located a little north of Bethleham, this location featured pygmy seahorses (Hippocampus bargibanti) at 90 feet, moray eels, lots of cool little commensal crabs and shrimp on soft corals and corallimorpharians, and of course a plethora of nudibranchs as encountered on most dives in Anilao. This is the closest we got to wall diving in Anilao, with sheer cliffs dropping down into the water and descending to several hundred feet. Dendronepthyea crab found while diving Kirby’s. Apol’s Rock After our dive at Kirby’s we headed off to Apol’s Rock, about 45 minutes boat ride north. 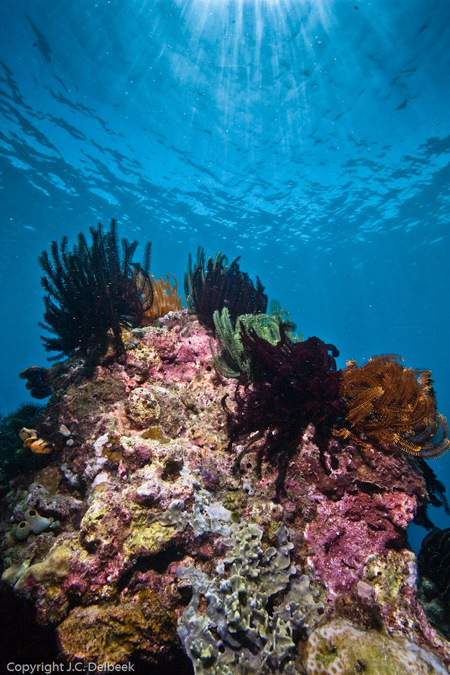 This dive site features an array of Acropora and other SPS corals, as well as coral bommies dotted along a sandy slope. It was here that we collected severalAcropora for the Academy using plastic bags and plastic containers to hold them. 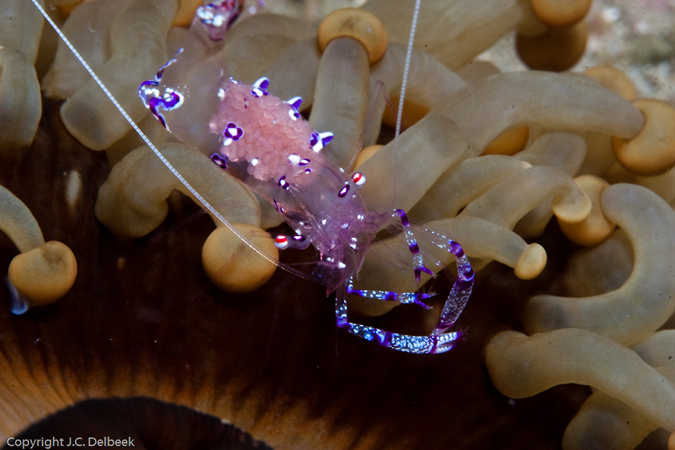 There were also several types of commensal shrimp seen living on a variety of anemones and even a large specimen of Pseudocornyactis. A Periclemenes sp. cleaner shrimp at Apol’s Rock, this egg carrying female was accompanied by five males on a Pseudocorynactis sp. anemone. 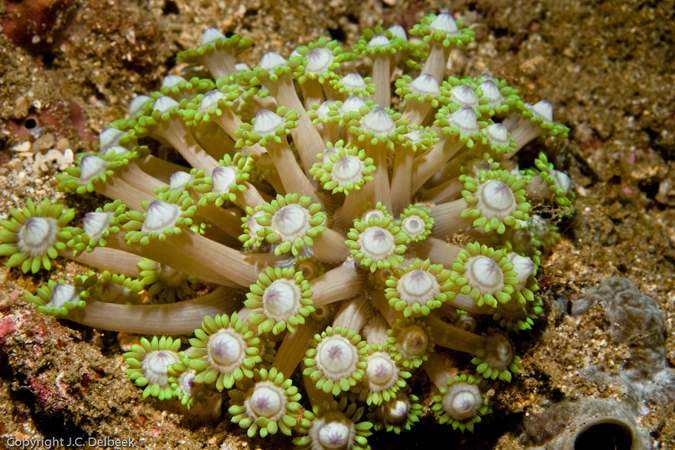 An unidentified species of Acropora, collected at Apol’s Rock for the Steinhart Aquarium. Basura The last night dive we did was at a site a short 5 minute boat ride up the coast from Club O, known as Basura. Now Basura is Spanish for garbage, and this site did have its share of garbage on the bottom, but what is one man’s garbage is another’s gold, and this is never so true as in the marine world where critters are always looking for homes, especially on bare, sandy areas. Unfortunately, I had to cut this dive short as the point at which my mask strap joined my mask broke, however, I did encounter a large school of shrimpfish (Aeoliscus strigatus) that had to number over 100! They swarmed me and then my dive buddy as they scrambled to find a hiding place. 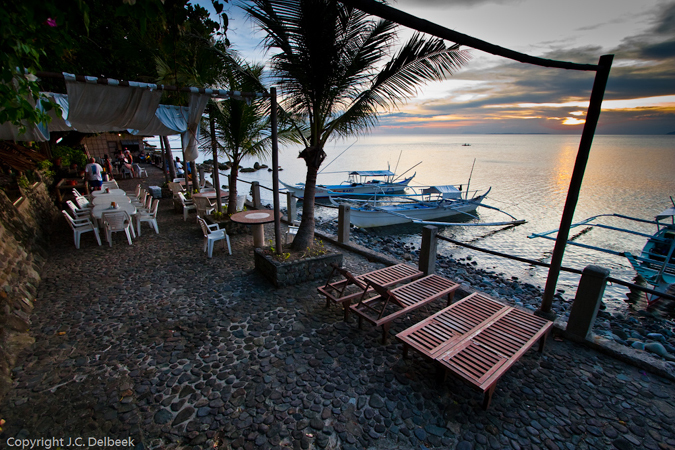 Conclusion Diving in Anilao is quickly becoming recognized as one of the top muck diving areas in the world. With the wide variety of accommodations available in the area, one can find something to fit any budget. 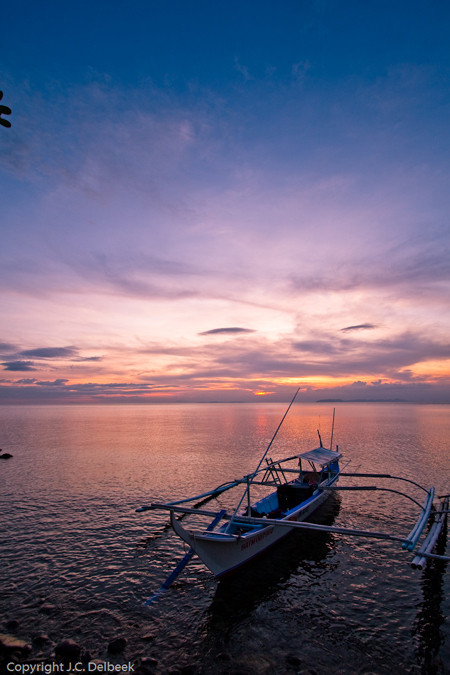 Only a few hours drive from Manila International Airport, the Anilao region makes for a very convenient dive destination for Europeans, Australians and North Americans, allowing for tremendously diverse dive buddy combinations. A banka awaits the dawn of a new day at Club Ocellaris.